Not long ago I wrote about respecting the authorship of photos on Wikipedia. Respecting the authorship of text is just as important, and failing to do so is even less excusable. Collecting information and writing up an original paragraph is something that can be done without leaving the convenience of your very chair. 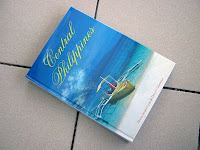 Today I went to National Bookstore to kill some spare time, and tucked away in a shelf with travel guides I find a big coffee table book called Central Philippines, published by PDP Digital and the Department of Tourism. 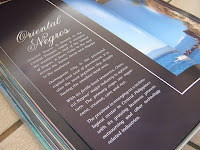 Oriental Negros is located in the Central Visayas region. It occupies the southeastern half of the island of Negros. It faces Cebu to the east across the Tañon Strait and Siquijor to the southeast. Dumaugete City is the provincial capital and seat of government. It is also the most populous city, despite having the smallest land area. With its fertile land resources, Oriental Negros' major industry is agriculture. The primary crops are sugarcane, coconut, corn and rice. The province is emerging as a technological center in Central Philippines with its growing business process outsourcing and other technology-related industries. "My, this sure sounds vaguely familiar, and very... encyclopedic," I thought to myself. Then it hit me-- this whole write-up was hacked up from pieces of the Negros Oriental article on Wikipedia. The first paragraph has been part of the article since it was created in 2003. The second and third paragraphs were actually added by myself in 2005 and 2006. The last paragraph was added by an anonymous editor in 2007. Then I flipped through the rest of the book-- and sure enough, yes, the introduction text for every province was ripped from Wikipedia, without attribution. The only conclusion that the casual reader could come to is that all this text was written by the authors whose names appear on the cover, Ms. Honey Jarque Loop and Mr. Daniel Carpentier. Plagiarism is the act of taking of someone else's work and presenting it as if it were your own. To take text from the world's most popular reference site and publish it throughout a $31.25 hardbound book... that's pretty brazen. Here's how it should work: Wikipedia is published under the GNU Free Documentation License. If you wish to reuse Wikipedia text in your own publications, you can do so in compliance with the license. The simplest way to do it is to include a notice that the text is licensed under the GFDL, along with a the text of the license, and a link to the original article. The way not to do it is to simply copy the text and allow people to assume you wrote it yourself. I'd love to have been a fly on the wall during that editorial meeting where they were debating whether or not someone else would notice. Hope you don't mind that I linked to this post over at my site, I also have a few other observations about drawing from Wikipedia for "literary inspiration". Eugene: Oh yeah, need to include the full text of the license. That is kind of a big thing to ask from book publishers. Hopefully the switch to CC will be approved. By the way, a lot of the text in that Central Philippines book is actually yours, since you made most of the province articles... I noticed a lot of sentences in the form "X is a province bordering Y to the north and Z to the south", etc. Ow, idemanda na natin yan, Coffee! Tama sila, the book should have included the full text of the license. Actually, you should be the author of the book. Tsk. This enrages me, we at Wikipedia try as much as we can to reference all the articles we create and closely monitors those that have issues with GDFL or GNU. This author is a lazy dumba**. Mike, were you able to double-check if maybe there is a Wikipedia attribution in a fine print somewhere in the book? I want to make sure that this is a clear case of plagiarism. Eugene: I recall scanning the opening and closing pages of the book, and checking the copyright page... didn't see anything. Maybe I could check it out again later today if I get the chance. Goodness, Mike! You should write them--really!